My New Year wish for you all is this is the time to unfold new horizons &realize new dreams to discover the strength & faith within u, the best year you’ve ever had, and that each New Year will be better than the last.WISHING EACH AND EVERYONE AND ALL THE READERS OF RUCHI a Very Happy New Year2011...! 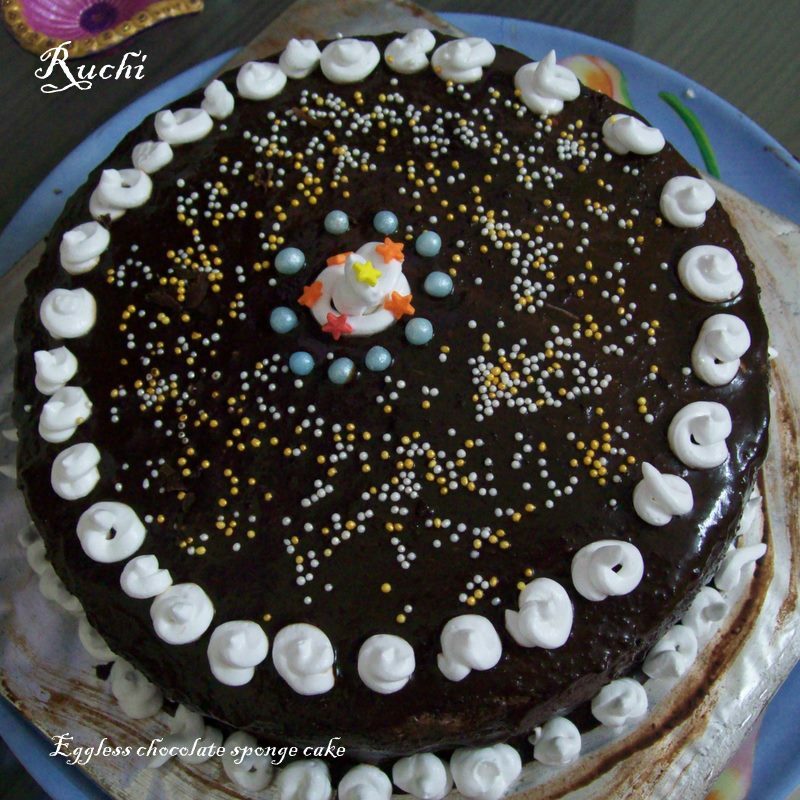 Egg less ChocolateSponge Cake is undoubtedly amongst the favorite dessert recipes all around the world. 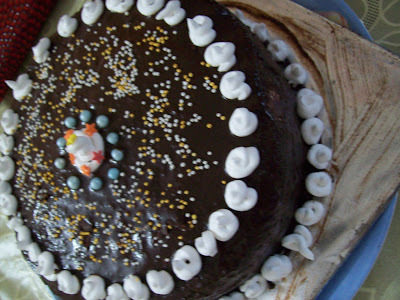 So I tried and tasted recipe for this sinful Eggless Chocolate sponge Cake for this New Year. The cake is very rich and melts into your Mouth. It is deliciously soft and moist adorned with some freshly made dark chocolate ganache.! Chocolate ganache can be made with dark, milk or white chocolate. Dark chocolate is used most often for the superb colour and rich flavour it imparts. The technique is simple, and merely involves melting chocolate with cream. In a medium sized pan, heat cream almost to a scald. Remove from burner. Add chocolate all at once, and whisk to blend smooth and melt. Chill ganache 1 hour or more to spread enough to decorate a cake. 2.Pour condensed milk in a bowl. Add the butter, and beat well till smooth. Add the flour spoon by spoon, mixing into the condensed milk mixture. 4.Once all the flour is used up, beat the batter as above till light (5-7 minutes) mix gently till smooth. 5.Pour into a greased cake tin. Do not smooth with a spoon etc. If the consistency is right this will not be needed. 6.Pre-heat over to 180o c. Place tin inside. Bake at 15-2o minutes or till done. 1. Slice the chocolate cake horizontally into two equal parts. 2. Place one half of the cake on a serving plate and sprinkle half the soaking syrup in order to make the cake moist. 3. Spread half of the ganche over the cake layer and sandwich with the other half of the cake. 4. Moisten this cake layer with the remaining soaking syrup. 5. Spread the remaining ganche on top and sides. 6. Serve chilled, garnished with swirls of whipped cream and grated chocolate. Wishing you and ur family a happy and prosperous new year...Beautiful and gorgeous cake Akka..
looks awesome..would love a bite..
Cake looks so pretty and yummy too! 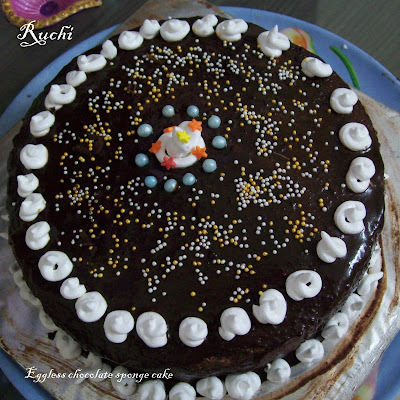 Aunty i have always wanted to try an eggless cake..Thanks fr d recipe!! Aunty ur cake looks absolutely ravishing. Thanks for sharing the recipe! Aunty ur cake looks absolutely ravishing! Thanks for sharing d recipe! What is the amount of sugar to be used .??? ?